Leave your car at the Maurlechnhof during your winter holiday! 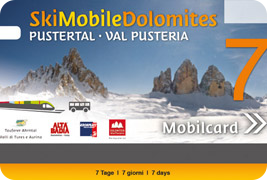 As our guest you get free upon arrival the Ski Mobile Card, a privilege card which entitles you to use of all public transport in South Tyrol for free, including the regional trains. In this way you are relaxed and stress-free traveling to the ski resort. And for the environment you are doing also something good by not driving your own car. If you want to visit the city of Bruneck or Brixen, you can go there for free using the Ski Mobile Card and do not need to worry about winter road conditions and fuel prices!